Report Center and Navigation Redesign–Is it for You? Mike Hoekstra is an SAP® SuccessFactors® Reporting and Analytics expert at Aasonn, an SAP® Gold Partner. He is certified in SAP® SuccessFactors® Reporting Tools, and as a Workforce Analytics (WFA) Technical and Functional Consultant. He leads new implementations, delivers training sessions, and assists clients in developing complex reports. SAP® SuccessFactors® Reporting and Analytics tools have expanded in number and functionality over the years. For both Reporting and Analytics creators and consumers, it can be challenging to navigate the different tools to find data and information. With Report Center, access to all reporting tools have been centralized into a single tool. 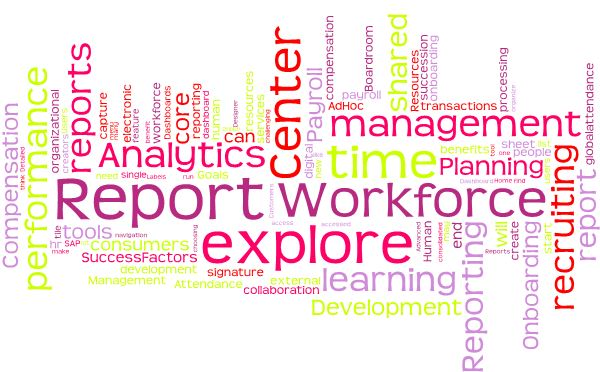 Workforce Analytics and Workforce Planning have been decoupled from the other Reporting tools and are available via their own respective Home menu links. What exactly is Report Center? Create a report–start with Report Center! Create a tile or dashboard–start with Report Center! Schedule a report to be delivered —start with Report Center! Run a report, or view a dashboard–start with Report Center! I think you get where I’m going here! In the Q3 2017 release, Report Center has become Generally Available and is an optional upgrade. Report Center is accessed by choosing Reporting in the Home menu. Other legacy tools, such as List Reports and Spreadsheet Reports, can be accessed by choosing Switch to Classic View. In the Report Center, any report (AdHoc, Detailed Reporting, Advanced Reporting), tile, or dashboard shared with the end user will be displayed in a single, consolidated list. This can be a long list of reports for many end users, and it very may well enact shrieks from those who had previously migrated from AdHoc Reporting to Online Report Designer! I really like the Labels feature. This feature empowers your Report consumers to organize their reports as they wish. Is Report Center the right tool for you? As is often the case, it depends. I’d recommend that you enable Report Center. Both your Report creators and your Report consumers will benefit from the streamlined navigation and “one-stop shopping” that is the Report Center. Today, do your Report consumers need to access reports in multiple locations (e.g. ORD, AdHoc, Dashboards)? If yes, they could certainly benefit from the consolidated list of shared reports. Do you have a lot of shared reports that are organized within folders in ORD? If yes, your reporting consumers will lose this organization in Report Center. This will be a potentially significant adjustment, and some thoughtful change management will be necessary. At the same time, your users may appreciate the “do-it-yourself” option to self-label and organize their reports on their own. Do new users initially find it challenging to create new reports or run shared reports? If so, the simplified navigation and single reporting repository will likely be a win. With Report Center, SAP® SuccessFactors® is delivering a new user experience for both report creators and report consumers. This is a nice evolution in the solution set, and I recommend that current and new SAP® SuccessFactors® Reporting customers take the time to evaluate if Report Center is a good fit for them.